Final preparations are underway for ‘Baked Alaska’, a play themed on climate change by the Riding Lights Theatre Company. 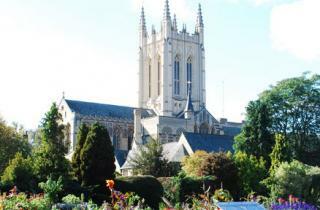 The performance takes place on Wednesday 23 September at St Edmundsbury Cathedral, Bury St Edmunds at 7.00 pm. In the high-energy, ‘seriously funny’ style for which Riding Lights is well known, Baked Alaska focuses on the realities of climate change with lots of flair, humour and clarity. Baked Alaska is part of the company’s autumn Tour, which is sponsored by Christian Aid and Operation Noah. The storyline is as follows: An island in the South Pacific has a problem. It’s hollow. Anxiety levels are rising in a North American boardroom. Eve’s garden is bursting with next door’s rubbish. Even the ducks have relocated… they’re in Bangladesh. From the four corners of the earth come colourful, inter-connecting stories of humanity living with the wild, unpredictable effects of climate change. We’re all in the mix and hungry for a recipe of hope. In the struggle over power, some sound the warming bell, some blow hot and cold, while others make a pudding of the planet. Tickets cost £12 / £9 (concessions) / £7.50 (under 18s in groups of 8+). Ticket sales are handled direct by the Riding Lights Theatre Company (Tel: 01904 613000 or online at www.ridinglights.org/baked-alaska). Tickets can also be purchased in person in advance from the Cathedral Office (01284 748720). A brand-new visitor attraction and community hub from one of Bury St. Edmund’s oldest buildings, the Guildhall.